Rainbow Valley Farm, Organic Valley and Dirt Capital Partners are partnering to develop an organic dairy operation in Aroostook County to serve as a replicable model and anchor for the emerging organic dairy market in the county. The project, named Northern Maine Dairy (NOME Dairy), will have meaningful economic development and environmental benefits to the Northern Maine region and throughout the state. Rainbow Valley Farm is owned and managed by Jeff Bragg, who is the 8th generation in his family to farm in Sidney, ME. Jeff’s son, Jake, recently starting working on the farm after 12 years in the US Air Force. Rainbow Valley is one of the larger organic dairy producers in Maine. NOME Dairy, LLC was recently created by Jeff and will be the operating entity for this project. Organic Valley (CROPP Cooperative) is a national, farmer-owned organic cooperative, and the largest buyer of organic milk in the country. Steve Getz, Organic Valley’s New England East Regional Manager, is based in Waterville ME and has been focused on growing organic agriculture in Aroostook County and across the state for several years. Dirt Capital Partners is a sustainable farmland investment company which partners with farmers on farmland access, transfer and succession. The company has completed 14 projects through New York and New England and has deep experience with organic dairy projects in Maine, New York and Vermont. Dirt Capital Partners acquired a 160-acre property in Woodland, ME on June 22, 2017. The property has excellent pasture but lacks dairy infrastructure. NOME Dairy is leasing the property and will harvest organic hay from the property until dairy barns and a milking facility are constructed. A detailed enterprise budget, building plans, and construction costs are in progress. The project has a contract from Organic Valley to ship milk from 150 cows. Rainbow Valley Farm will provide heifers, which will be ready to milk starting in 2019. The project team is seeking one or more financial partners to provide support in the form of a loan and/or a partial guaranty for construction of the dairy buildings. The cost for this is estimated at $350-450,000. Additional investment and partnership opportunities will emerge as the initiative grows in scope and impact. Aroostook County has tremendous agricultural resources in its land and farmers. Historically, its travel distance limited market access for agricultural products with the exception of commodity potatoes. In the last few years, organic dairy and grain production have gained traction and momentum. Aroostook County has excellent soils, affordable land and a large commodity potato industry. Over recent decades, conventional potato growers have abandoned smaller or more gently sloping fields that do not accommodate large equipment, which creates an opportunity for pasture-based business to utilize affordable and high quality agricultural land in the County. Its distance to markets, short growing season, and lack of infrastructure for processing crops have all made it difficult for farmers to utilize this land and diversify their businesses -- with the recent exception of organic dairy and grains. In 2014, Organic Valley, a farmer-owned co-op with an extraordinary commitment to supporting farmer-livelihoods and rural economies, started sending a milk truck to Aroostook County to source from a few existing and several start-up dairies there. The interest among farmers in the area has been strong, and there are now twelve organic dairy farms shipping milk to Organic Valley, and two more (including this project) with contracts to start sending milk in 2018. In 2013, there were only two organic dairy farms and three organic grain farms in Aroostook County. By 2016, there were twelve of each. A vibrant cluster of organic dairy farms has significant, positive economic and ecological benefits to the region’s agriculture sector. The growth of organic dairy in Aroostook County has and will continue to have beneficial ripple effects for the area's agricultural economy and ecology. Dairy farms are a large consumer of agricultural products and services including feed, bedding, custom harvesting, equipment supply and repair, nutrition, breeding and veterinary services. And with more dairies, organic grain, forage and bedding production can become an increasingly viable alternative to conventional potatoes for many farmers in the area. Organic dairy farms create market demand for feed-quality grain and forage production as a part of crop rotations, an essential element for viable organic grain enterprises in the Northeast US. Organic potato production is also increasing in Aroostook County, and the best organic potato production practices require a 5 year crop rotation, in which forage and grain crops can be grown in the other 4 years, offering a revenue generating rotation, with sales to local dairy forage customers. Additionally, a critical mass of pasture-based livestock will have tangible benefits to the broader agroecology of the area. 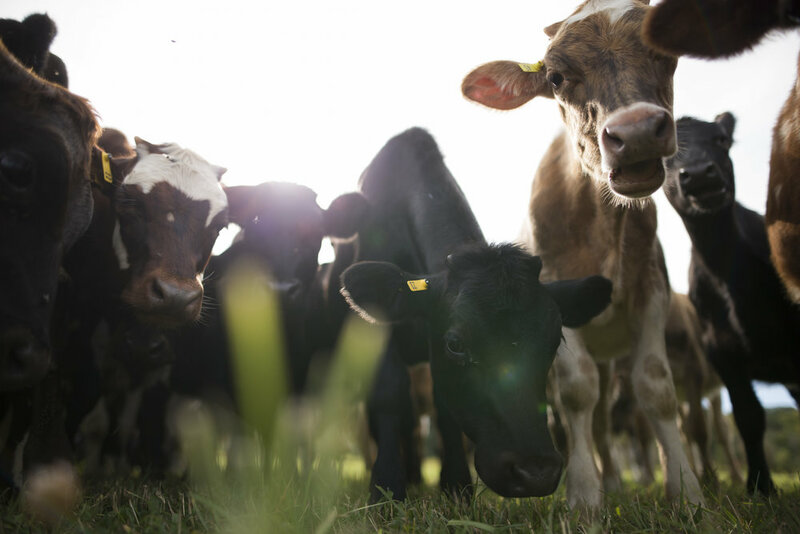 Cows on pasture improve soil health, sequester carbon, and generate manure, which can be used as a natural fertilizer on other organic farms throughout the region. Organic fluid milk dairy production is a viable farm business model in rural areas; dairy cooperatives like Organic Valley manage transportation, processing, packaging, distribution, marketing and sales. Organic dairy farmers focus on managing cows and pasture, while a milk buyer transports raw fluid milk for processing and distribution to markets. Organic Valley does all of the marketing, sales and distribution for its farmer owners. Farmers get paid a price for their milk that allows them to make a living while farming. Organic Valley is a farmer-owned cooperative that currently includes more than 2,000 farmers across the country, including 47 dairy farmers in Maine. In addition, Organic Valley’s other producers in Maine include grain growers and produce pool members. The organic dairy farm business model is a viable one in Aroostook County as long as the milk supply grows to fill Organic Valley’s first milk truck. Among the 12 existing organic dairy farms in the county, approximately 30,000 lbs is being produced every other day and picked up by a 55,000 lbs tanker. The NOME Dairy initiative will add an additional 15,000 lbs of milk by 2020. This one tanker represents approximately 3,500 acres of organically managed land impacted in Aroostook County (an average organic dairy herd requires on 5 acres of land per animal of pasture, hay, and grain to satisfy annual feed requirements). This initiative builds on and complements other previous and ongoing organic initiatives in Aroostook County. Efforts to nurture organic grain and dairy production in Aroostook County started before 2010, the year that Maine Organic Milling (MOM) and Maine’s Own Organic Milk (MOO Milk) both launched with initial presence in the county. While neither organization exists today, their efforts helped create fertile ground for a new generation of organic initiatives. In 2011, MOFGA hired John Chartier to lead its technical assistance efforts in Aroostook, providing a “one stop shop” for northern Maine farmers and gardeners to get information and MOFGA services and connected to each other and external resources. In that same year, Steve Getz of Organic Valley also took his first trip to Aroostook County and was impressed by its dairy potential. A tour of county projects with local food investors, organized by Slow Money Maine, followed shortly thereafter, in 2012. In 2014, MOO Milk was forced to close down due to an equipment failure and inability to recapitalize. Organic Valley offered membership to six of the former MOO Milk producers, including two in Aroostook County. OV had its first Aroostook pick-up of these two farms in July 2014. Also in 2014, the Organic Trade Association and Sustainable Food Lab launched the “US Organic Grain Collaborative” with project partners including Organic Valley, Stonyfield, Whole Foods, General Mills and Annie’s. Following a report identifying barriers to increase organic grain production nationally, Aroostook County was selected as one of two target regions for focused efforts, which are ongoing. And in December 2016, the Maine Technology Institute awarded a $50,000 grant to the Maine Grain Alliance: the funds are to study grain drying and storage systems on four farms in Aroostook County in order to expand regional production capacity. A set of template documents (building plans, financial budgets, legal templates) resulting from the project will be publicly available, for others to replicate organic dairy development projects in Aroostook County and elsewhere in Maine. CEI provided initial grant support in 2016 for initial enterprise budgets for the project, which were developed by consultant Sarah Flack in partnership with Rainbow Valley Farm. Dirt Capital is revising this model for the specific site and infrastructure requirements. NOME is working with support from Iowa-based Larry Tranel (a leading designer of low-cost parlor designs) on final plans for dairy buildings. Rainbow Valley, Dirt Capital and other partners will develop the legal template for the farm transfer. NOME will hire a young, skilled dairy farmer to manage the day-today activities of the farm, with the possibility of transferring ownership in the enterprise to the young farmer over time. The young farmer has already been identified. The project will also be a site where participants in Wolfe’s Neck Farm’s Organic Dairy Farmer Training Program can intern.